The arrangements in this book are suitable for all E-flat instruments (alto/baritone sax, E-flat horn). For each worship song and hymn an independent part is given which adds interest for the performer and enhances the beauty of worship. There are six books in the series, each containing at least 100 arrangements covering all the worship songs in "the source"
The Source : Bk. 6. 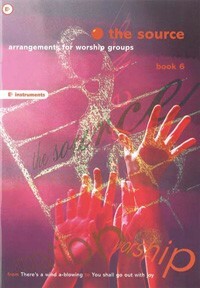 Arrangements for Worship Groups (E Flat Instruments) by Chris Mitchell was published by Kevin Mayhew in November 1998 and is our 20147th best seller. The ISBN for The Source : Bk. 6. Arrangements for Worship Groups (E Flat Instruments) is 9781840032543. Be the first to review The Source : Bk. 6. Arrangements for Worship Groups (E Flat Instruments)! Got a question? No problem! Just click here to ask us about The Source : Bk. 6. Arrangements for Worship Groups (E Flat Instruments).